A pack of Seattle’s Private Reserve premium joints is a thing of beauty indeed. The graphics have an old-world elegance, and seeing the Space Needle logo and Seattle skyline embossed on a pack of joints? Well that fills our hearts with Washington pride. It’s a good thing to live in the state that produces the world’s finest legal recreational cannabis. Speaking of fine local weed, the folks at Seattle’s Private Reserve have built a sterling reputation for their potent flower and their pure cannabis extracts. For light hydrocarbon extractions they use an I502 compliant close loop extraction system; all gases used in extraction are redistilled to ensure purity, producing wicked cannabis shatter, wax, and honey oil. Here at Greenside Recreational, we’re proud to carry the brand’s most popular strands and products. Recently we lit up a bowl of Raspberry Kush. This 50/50 hybrid produces pretty buds with purple highlights, furred with auburn pistils. We noted that the brand’s commitment to cold-curing is evident–this goes down easy and the smell is pure and perfect. The trademark berry aftertaste is delectable and the high is cerebral and pleasant. While this was pleasant, we needed a point of comparison so we decided to sample another Seattle’s Private Reserve product — sticky buds of Legalized OG. This 70/30 Indica dominant hybrid is a classic OG, with a dank, piney aroma and a strong flavor of crystallized lemon. This definitely packs more of a punch than the Raspberry Kush, and suddenly we were no longer in “research” mode, but rather lounging on the couch mode. We’ll call that a win! Stop by your favorite Seattle-area cannabis shop to check out our selection of Seattle Private Reserve. 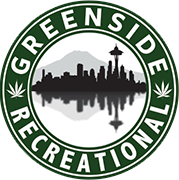 Greenside Recreational Seattle and Greenside Recreational Des Moines carry a fine selection of Private Reserve flower,including popular strains like Blackberry Kush and Legalized OG. Our Des Moines pot shop also carries Seattle’s Private Reserve cannabis shatter, pull n’ snaps, and terp sauce.